In the spring and summer of 1961, several hundred Americans—black and white, male and female—entered Southern bus and train stations to challenge the segregated waiting rooms, lunch counters, and bathrooms. The Supreme Court had ruled that such segregation was illegal, and the Riders were trying to make the federal government enforce that decision. Though there were Freedom Rides across the South, Jackson soon became the campaign's focus. The 329 Riders arrested there were quickly convicted of breach of peace. The Riders then compounded their protest by refusing bail. "Jail, no bail!" was their cry, and they soon filled the city's jails. Mississippi responded by transferring them to Parchman, the infamous Delta prison farm, for the remainder of their time behind bars, usually about six weeks. New to this expanded edition are five portraits made in the maximum-security cells at Parchman during events commemorating the fiftieth anniversary of the Freedom Rides in 2011. The mug shots of each Rider, bearing name, birth date, and other personal details, were duly filed away by agents of the Mississippi State Sovereignty Commission, a state investigative body dedicated to preserving white supremacy. By carefully preserving the mug shots, the Commission inadvertently created a testament to these heroes of the civil rights movement. Eric Etheridge has worked as an editor for magazines such as Rolling Stone, Seven Days, the New York Observer, and Harper's. The Freedom Rider portraits and mug shots have been widely exhibited. Sixteen were included in the civil rights photography show Road to Freedom, which originated at the High Museum in Atlanta and traveled to the Smithsonian in Washington, DC, the Field in Chicago, and other venues. "By pairing mug shots with contemporary portraits—and providing stories about individual Freedom Riders—Mr. Etheridge undoes some of the psychic and social damage perpetrated by these symbols of police malfeasance. Breach of Peace corrects the historical record, representing its subjects not as dehumanized icons of criminality but as exemplary citizens and complex human beings." "An arresting and stunning artistic feat." Fast-forward nearly fifty years and we do, indeed, get to see: The updated portraits project fatigue and wisdom, fierceness and serenity. There are soulful eyes and droll smiles, and of course all the faces bear the etchings of time. The pictures draw you in, but the text makes you linger. What has happened, over the decades, to these young, earnest people? Brief interviews and mini-biographies become mesmerizing time capsules, allowing you to eavesdrop on details of the riders' lives, as if overhearing snippets of conversation from an adjacent bus seat." 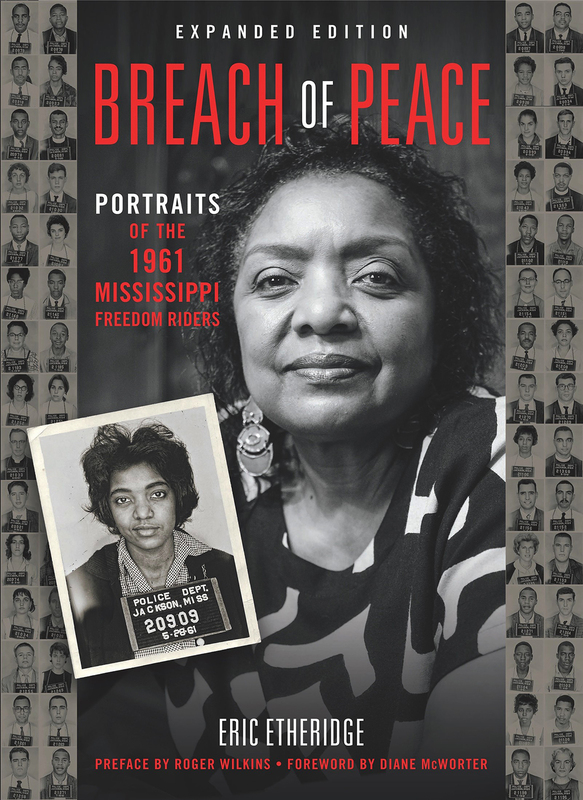 "The uncovered mugshots and subsequent interviews with those arrested in Jackson form the heart of Etheridge's 2008 book Breach of Peace: Portraits of the 1961 Mississippi Freedom Riders, an extended version of which is available now. The latest edition contains all 329 mugshots and contemporary portraits of 99 riders. (The 2008 edition had 84 portraits.) But the most fascinating piece of the book is a series of extended interviews with riders. Many of the sit-downs . . . detail the riders' lives back home, what compelled them to join the cause and the police violence they experienced during their incarceration following the incidents at the bus depot." "The mug shots turn out to be a remarkable exercise in folk portraiture. Seeing them side by side with Etheridge's terrific portraits of the same men and women forty-five or more years later exerts a fascination reminiscent of Michael Apted's 'Up' film series. The interview excerpts bring to life the experience these people shared—not just the rides, the arrests, and the beatings but also, in many cases, the weeks or months they spent in jail afterward, often in the fearful confines of the infamous Parchman prison farm. We learn what they were doing before the rides and what they have done since."